The zero-emissions car has reached the rally's half-way point after stage 6 was cancelled due to extreme weather conditions. After a 20% abandonment rate among in the Cars class, ACCIONA 100% EcoPowered is advancing in the challenge to demonstrate the efficiency of renewable energy in the world's toughest land rally. 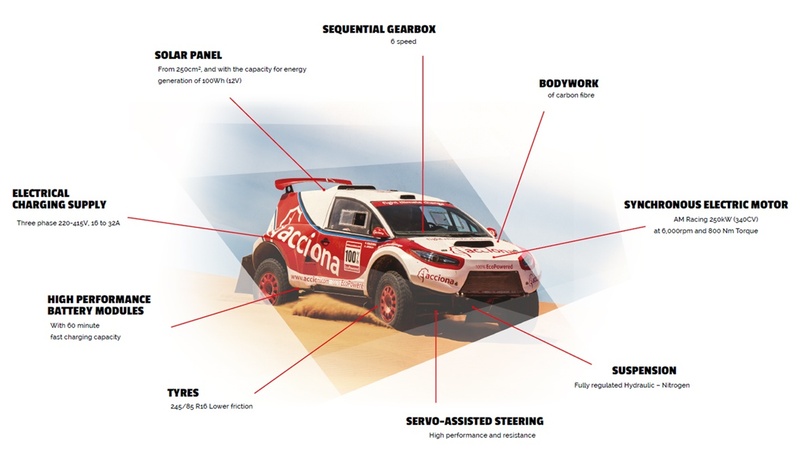 The world's only all-electric high-end rally car, ACCIONA 100% EcoPowered, successfully reached the half-way point of the Dakar rally, marked by extreme weather and a gruelling route, once again evidencing the competitiveness of renewable energy. The Spanish team, headed by Ariel Jatón, has reached La Paz (Bolivia) after the rally organisation cancelled stage 6 due to extreme weather conditions. ACCIONA's car has travelled over 4,000 kilometres so far and is still very much in the running to complete the world's toughest rally; it is the only one of the 491 participating vehicles that has not consumed a drop of fuel or emitted a single molecule of CO2 since it left the starting line in Asunción (Paraguay). EcoPowered reached the half-way point of the legendary rally after completing one of the most difficult parts of the route, located over 3,500 metres above sea level with temperatures topping 50ºC, including a final stage marked by torrential rains in which the water toppled one of the team's charging vehicles, though without causing injury or damage. During the rest day, the team will prepare for the decisive final stage of the Dakar rally. The rally resumes on Monday with a two-day marathon without assistance, an additional challenge for all participants. This 39th edition of the Dakar rally, which the event's sport director, former champion Marc Coma, describes as "the toughest in South America", saw a total of 16 teams abandoning in the Cars class. In the words of ACCIONA 100% EcoPowered pilot, Ariel Jatón, “it started out very tough: the heat in Paraguay, the mud when we crossed into Argentina, and now a rainstorm. Water and electricity don't mix very well, so our battery and system insulation was put to the test and passed with flying colours". This ACCIONA project lends visibility to its defence of the environment and its position combating climate change, aligned with the agreement signed by 195 countries at the Paris Summit, which came into force recently. The only electric car in rally completes first half #ACCIONADakar Go @ACCIONADakar @ACCIONA_EN! ACCIONA 100% EcoPowered is the result of research and development work since 2012 by a multi-disciplinary team under the guidance of the R&D and Innovation Department of ACCIONA, a Spanish renewable energy and infrastructure company. The vehicle is entirely Spanish-built: it was produced in Vilanova del Vallés, a small town 30 kilometres from Barcelona. EcoPowered is the world's most powerful electric car, packing 250 kW — equivalent to a 340 horsepower combustion engine — thanks to an innovative power train comprising a synchronous electric motor, six fast-charging on-board batteries and a backup instrumentation power system driven by a high-performance rooftop solar panel with a rated capacity of 100 W.
It has been upgraded for this Dakar rally with a chassis re-design, lighter batteries, a six-gear sequential gearbox and enhanced 4-wheel traction.